Shade is an important issue in the desert. I live in Phoenix so I have become an expert at looking for shade. At my grandson’s flag-football game just this week, we were all huddled under canopies and sun umbrellas. It might be cold where you live, but our winter – especially this year – is hot and sunny. It was really hot at his game with the sun beating down on us. Some of the grocery stores in our city are starting to cover their parking lots with solar panels – getting some extra revenue and providing shade for their customers and their customer’s cars. It’s a great idea! There are a lot of us who would drive several extra miles to get covered parking while we shop. In their journey to the Promised Land, the Israelites spent many years walking through the desert. In Numbers, we are told that ‘the cloud of the LORD was over them by day when they set out from the camp.” I have read that many times but I just realized that God was not only guiding them. He is providing shade for them. Much-needed shade. At night, God’s cloud would settle over the tabernacle and look like fire. This made it possible for everyone to still see it in the dark – a constant reminder of God’s presence and care for them. When God wanted the Israelites to move, the cloud would lift off of the tabernacle and become a shady guide for their journey. How great it would be to have my own cloud! It would show me the way – telling me when to go and when to stay. I have air conditioning, covered parking and sun umbrellas so I don’t need the shade but I could really use his clear guidance. Oh, yeah. I have my own cloud. God has given me his Word and the Holy Spirit. 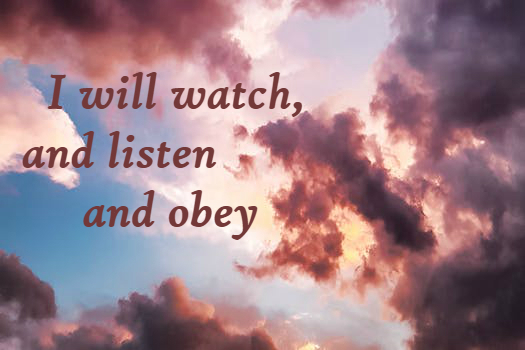 He has promised to light my path as I read and listen carefully and obey. He constantly reminds me through his Word how he is with me and he cares for me. I’ve got all the guidance I need. Thank you for still being our cloud, Abba Father.